The ups and downs of producing a large-scale show – especially if it’s your first time! 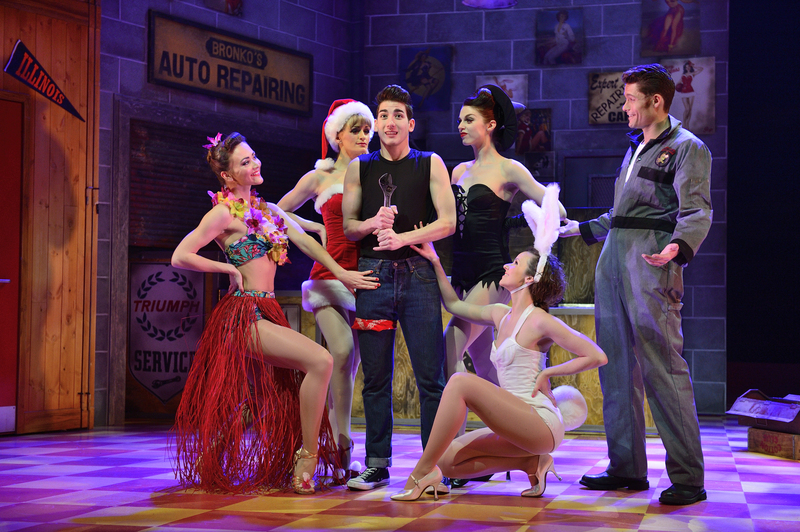 Read about intrepid newbie Amy Anzel‘s staging of “Happy Days” here. The process of putting on a show is long, laborious and hard, most especially when you are a new producer – as Amy Anzel is. Happy Days is Amy’s first major production – and it’s an extremely ambitious one. No small-scale fringe show, this is a full size musical complete with brand new score, cast of 17 (including three star names) and a band of eight. It is currently touring 24 UK cities and the hope is it will end in a West End run. Not many would be so bold- or so tenacious. And the show has not been without its troubles. Some of these, such as the difficulty of casting the all-important role of “The Fonz”, were well documented in the Channel 4 programme The Sound of Musicals. As well as that, the original director, Craig Revel Horwood, pulled out of the project and there were a myriad of other challenges too- not least, a wall of negativity and the ubiquitous prophets of doom. It all started in Amy’s mind when she arrived in this country four years ago. She had participated as an actress in the original developmental workshops of Happy Days ten years ago in the States, and saw the production come to light there and in Italy. When she came to the UK to live, she noticed that 1950’s Americana was very popular here, with West End productions of Grease and similar shows doing well. She called Garry Marshall, the creator of the TV show and writer of the book, and proposed she produce it here. Once having optioned the rights, she launched into action, contacting producers with the hope of a co-production, casting, booking theatres and so on. “Andrew has always discussed things with me, not least because he knows I was in the development workshops and I saw first-hand what works. I think it’s essential on a new musical for us to work in a collaborative way”. She is also delighted with the design by Tom Rogers. The set is indeed masterly, evoking a juke box with scenes familiar from the TV series – the kitchen and Arnold’s diner, as well as The Leopard Lodge reminiscent of a Rotary Club or Masonic Lodge here. The set’s original concept was based on a children’s pop-up book, revealing surprises, and is changed seamlessly from one scene to another by the cast themselves in full view of the audience. I asked how she funded the show. She confirmed that she put in about £30,000 of her own money over the four years in getting it open. She also had success in Crowd-funding, and secured help from a financial investor. She was not able to persuade a theatrical producer to invest, but is able to work with one on the managerial side. She also had a stroke of luck when someone who had seen the TV series offered her investment as well. “I found I was meeting so many people, and having so many extraordinary experiences, I thought : ‘This would make a great TV programme!’”. She wrote to many TV production companies, including Fresh One Productions, the production company that was responsible for Musicality, and it turned out they had been thinking about similar themes. The show was eventually green lit by Channel 4. With such a rollercoaster journey, I asked what advice she would give to a new producer. I saw the Saturday matinee show in its opening run at Churchill Theatre, Bromley. Whilst it is a fun feel-good family show, with a good cast, some very nice songs and great ensemble pieces, at that time it still had a few flaws. However, Amy is aware of them and addressing them as she goes along. It is, after all, partly what a tour is for – a chance to discover and iron out the kinks, as well as to build audience in other parts of the country. To have come this far is an enormous achievement, completed against all the odds, with many advising against even trying. Without divulging things I promised not to, she has had more than one significant let-down, people in important positions not taking her or the project seriously, and she has battled against superciliousness with a combination of grace and fortitude. Who can say at this stage whether the piece will get a West End run, but with Amy’s level of determination, I wouldn’t be surprised. You cannot help but want to root for her and egg her on to realise her dream – all power to you, Amy! This entry was posted in Features - Theatre and Cabaret News and tagged Amy Anzel, Andrew Wright, Craig Revel Horwood, fiona jane weston, Fresh One Productions, Happy Days. Bookmark the permalink.